A new book claims to give readers an inside look at the Council on American-Islamic Relations (CAIR), arguing everything from its claims of financial and political clout to its genuine agenda are rooted in deception. 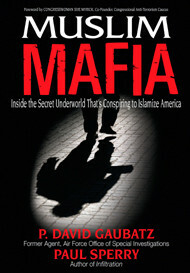 Muslim Mafia: Inside the Secret Underworld That's Conspiring to Islamize America is based in large part on access to CAIR operations obtained by Chris Gaubatz, the son of co-author P. David Gaubatz. Using an alias, the younger Gaubatz spent six months as a CAIR intern in 2008. Working under the name David Marshall, Chris Gaubatz worked closely with CAIR leadership including Executive Director Nihad Awad, Communications Director Ibrahim Hooper, and Legislative Director Corey Saylor. Chris Gaubatz claims to have walked out with 12,000 pages of documents (most of which he had been instructed to shred) and 300 hours of clandestine video. Among the findings from co-authors Gaubatz and Paul Sperry: that CAIR wildly exaggerates its membership numbers, that it is plagued by budget problems and dissension, and that it is financially dependent on a small network of wealthy Persian Gulf-based donors. In many cases, the book adds precision to general facts about CAIR that already are in the public domain. For example, the Washington Times reported on CAIR's dwindling membership rolls in 2007, only to have officials vehemently deny the story. According to Muslim Mafia, however, CAIR had just 5,133 members at that time, a far cry from its claim of 50,000 members and further still from its stated goal of 100,000 members set at a 2002 board meeting. CAIR has sought to blame its membership and financial problems on the U.S. government's decision to list it as an unindicted co-conspirator in the Holy Land Foundation terror-finance case. But its problems started well before the designation. Internal records from the 2002 meeting showed CAIR's membership was just 9,211 nationwide – with 903 people in California, 1,219 in Virginia, 870 in Texas, 775 in Illinois and 768 in New York. Those figures, the authors argue, challenge CAIR's claim that it is a representative of the American Muslim community: "Using Pew Research's survey estimate of 2.5 million American Muslims, CAIR's current five thousand members represent just two-tenths of one percent of the U.S. Muslim population. Using CAIR's inflated guesstimate of seven million American Muslims, CAIR represents an even smaller fraction of the Muslim community." Muslim Mafia claims that CAIR relies on two dozen wealthy supporters, many of them from Persian Gulf countries including Saudi Arabia, Qatar and the United Arab Emirates, for 60 percent of its $2.7 million annual operating budget, including one donor who contributes $600,000 a year. The authors point to notes from a 2006 board meeting where Awad reported that the Washington public-relations firm Hill and Knowlton had put together a "business plan" to help CAIR raise money from other Gulf states. State Department records obtained by the Investigative Project on Terrorism show that that year, CAIR officials, with Hill and Knowlton in tow, sought huge donations from the United Arab Emirates and Saudi Arabia. Meanwhile, IRS tax filings show CAIR's income from membership dues has been plummeting. In 2006, CAIR operated at a loss of more than $160,000 – more than triple the $50,000 deficit the group sustained in 2005. In 2004, by contrast, CAIR had a surplus of more than $338,000. "Membership dues measures [sic] the organization's success and base of support," CAIR notes in a section of its report to the IRS explaining why it collects dues. But its IRS filings show dues plummeting from more than $700,000 in 2000 to just over $40,000 in 2006. The bottom line, the authors say, is that "CAIR is unsupported by the broader Muslim population, which finds it more a liability than an asset. And given the anemic size of its member database, CAIR cannot possibly deliver on its threats to bring the weight of the Muslim community to bear against national politicians, CEOs, or advertisers for media personalities it doesn't like." But even though CAIR is a paper tiger when it comes to mobilizing Muslim voters, the organization has had numerous successes in other areas – particularly in undermining law-enforcement efforts to secure Muslim cooperation in terrorism investigations. In January, the Investigative Project on Terrorism broke the news that the FBI had cut off access to CAIR after evidence in the HLF trial showed CAIR founders were part of a Hamas-support network in the U.S. In a subsequent letter, an FBI official said questions about CAIR's relationship to Hamas led to the conclusion the agency could "not view CAIR as an appropriate liaison partner." Anecdotes in Muslim Mafia won't help the organization return to the FBI's good graces. It offers examples of CAIR's efforts to impede federal investigations related to terrorism despite its claim to be a partner to law enforcement. For example, Chapter Six details the way CAIR coached a mosque leader in Western Maryland not to cooperate with an FBI investigation of suspicious activity. Likewise, a 2004 investigation was thwarted when the FBI raided the Institute for Islamic and Arabic Sciences in America in Merrifield, Va. on suspicions of terrorist activity. But when the agents from the Bureau's Joint Terrorism Task Force arrived, the book claims, the building had been cleaned out because CAIR had warned institute officials of the raid. Another chapter is devoted to the case of former Fairfax County,Va. Police Department Sergeant Mohammad Weiss Rasool, who pled guilty to illegally searching a federal database in order to tip off a terror suspect about an FBI investigation. "He's a habitual liar and a traitor," a senior FCPD official said of Rasool. "He disgraced the uniform." As CAIR's representative on the police force, Rasool traveled into the District of Columbia to meet with CAIR Executive Director Awad. A CAIR visitor log published on p. 325 of the book, documents one of Rasool's visits in 2005. Al-Amin was convicted in 2002 of killing a Georgia police officer. CAIR and other Islamist groups have touted his case, but the book shows CAIR gave directly to his legal fund. Other published documents indicate a dysfunctional working environment in CAIR's Washington headquarters, including allegations Sunni Muslims are treated better than Shia. A September 2004 staff memo by senior official Khalid Iqbal expressed concern about "Lost productivity," "Low employee moral [sic]"; and lack of advancement opportunities and high turnover, with more than 50 percent of CAIR National's workforce leaving in the past year. Pages 321-324 of the book feature a detailed letter by Tannaz Haddadi, an official in CAIR's Washington office, alleging that she was demoted by Mr. Iqbal after he learned that she was a Shia. Haddadi details her efforts to get Awad to intervene without success. Most of the attention Muslim Mafia has received thus far focuses on details of CAIR's efforts to place interns in congressional offices, especially with members serving on committees covering Justice and Homeland Security. The authors publish a 2007 memo in which Saylor reports that he placed Samia Elshafie in a "Congressional Fellowship" in the office of Rep. Sheila Jackson-Lee (D-TX). The authors identify Elshafie as "the congresswoman's office contact for human rights issues." On Wednesday, U.S. Rep. Sue Myrick, who wrote the book's foreword, was joined by three fellow Republicans in asking the House Sergeant at Arms to investigate whether CAIR infiltrated congressional offices – specifically judiciary, homeland security and intelligence committees. Additionally, the lawmakers are asking the Internal Revenue Service to investigate the legality of CAIR's tax-exempt status. CAIR still has its protectors in Congress, though, who stand by the organization despite repeated and harmful documented disclosures. U.S. Rep. Loretta Sanchez, D-CA, has issued a statement denouncing Myrick and her colleagues for seeking an investigation of CAIR's efforts to infiltrate Congress based on allegations contained in the book. So far, CAIR has not challenged the veracity of the claims in Muslim Mafia. Instead, it has focused on the authors' political backgrounds and minimized the findings. "All they can come up with is that we are political active?" Hooper asked in a Politico story. "The terror threat is that Muslims are politically active?" That seems a deliberate attempt to misstate the issue, which is not whether Muslims should be employed on Capitol Hill or anywhere else. It is whether CAIR is an honest and reliable broker for American Muslims. The record, already long and detailed before Muslim Mafia's publication, shows CAIR habitually engages in deception about its activities. The book reinforces that conclusion with internal examples. Eventhough I reside in Canada, the information contained in the book is astounding! , and the research done by Chris and his father is worth a medal. Hopefully governments in your country and mine will pull-off the veil and expose the real threat that looms over North America. May Liberty and Truth prevail. HDV. Does WND's (lack of) credibility hurt the cause? PHENOMENAL WORK FOR A PHENOMENAL BOOK!! Truth is stranger than fiction...the incredible job done by Chris Gaubatz while serving as a volunteer intern at CAIR's National Headquarters is something that would make Jack Bauer on '24' blush with envy! !